ICT in education is important: Learn for the FUTURE, not some nostalgic view of the Past. Why are ICTs important in Education ? In the educational settings, teachers and educational ministers as myself, use a Australian National framework, better known as the Australian National Curriculum (ACARA), that helps us as teachers have the same professional standard that we are to follow, outlining what is to be taught to students and a mission to improve the learning of all students. The Australian National Curriculum focuses heavily on the 'General Capabilities' integrating ICTs into the classroom context helping students create and communicate information and ideas, solve problems and work collaboratively in all learning areas at school, and in their lives beyond school. Christopher Moore, explicitly highlights the importance's of integrating ICT into the classroom settings, backed up by other researchers evidence on how ICT is used to it's potential to effectively improve teaching and learning across the curriculum. A large focus of this web-page explains how ICTs are used to enhance students learning and therefor directly linking to the Australian Curriculum. So.. How do we integrate ICT in the classroom? Within the classroom we are lucky enough to have some great ICT resources in the school, that are shared amongst classrooms. Almost every classroom has an Interactive White Board, Computers (approx. 5 per classroom), Video recorders, digital cameras, ipods and telephones. 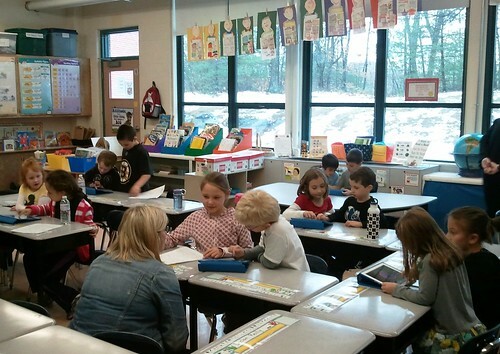 The school is limited to approximately 50 Ipads that get shared between classrooms as well as extra computer areas e.g. in the library. No, these ICT resources are not for students to play games on like they might do at home. These resources assist teachers and students in using an array of ICTs to enhance and engage the teaching and learning processes explored more deeply in the following pages of this web-page.